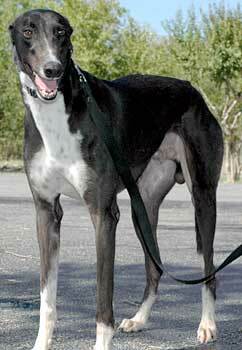 Ace, aka No Worries, is a large 3-year-old black male, born April 12, 2003. 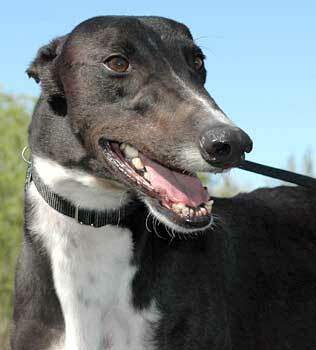 His sire, Bearablity, is an Australian greyhound, certainly an appropriate daddy for a dog named No Worries, and Ace's dam is R's True Love, a southern lady who taught her boy a bit about style. Wearing a dashing tuxedo and nifty knee socks, Ace is a hands-down winner in the best-dressed category. No doubt he turned heads when he stepped onto the track in his racing silks. 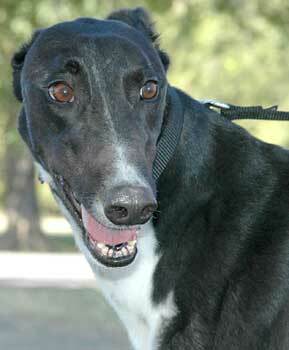 Ace gave it his best at Gulf Greyhound Park and although he competed in more than 80 races, he wasn't a top finisher. Thinking a change in locale could prove motivational, Ace decided to give it a go at the Corpus Christi track. On July 26, his mind wasn't on the job, and in what proved to be his final race, Ace chose not to cross the finish line. Ace and his employer decided a career change was in order. Dallas sounded like his kind of town, so Ace turned to GALT for help in locating a permanent address. It is not yet known if he is small animal or cat tolerant.